Artist Cavaradossi (Jonathan Burton) kisses the hand of singer Floria Tosca (Elena Stikhina) in the Boston Lyric Opera production of TOSCA, running Oct 13-22 at the Cutler Emerson Majestic Theater. Very well staged and sung in that gem of a theatre where every voice shone, this was a compelling version of one of the most popular of all operas. And what voices they assembled! From the opening moments when Angelotti, who has just escaped his political imprisonment in Castel Sant'Angelo enters Rome's church of Sant'Andrea della Valle seeking refuge in his family's chapel, we knew we had a strong cast. David Cushing conveyed the desperation of his character. James Maddelena was a bit of luxury casting for the Sacristan, who complains of spending his time cleaning paint brushes for the artist Cavaradossi without many thanks. 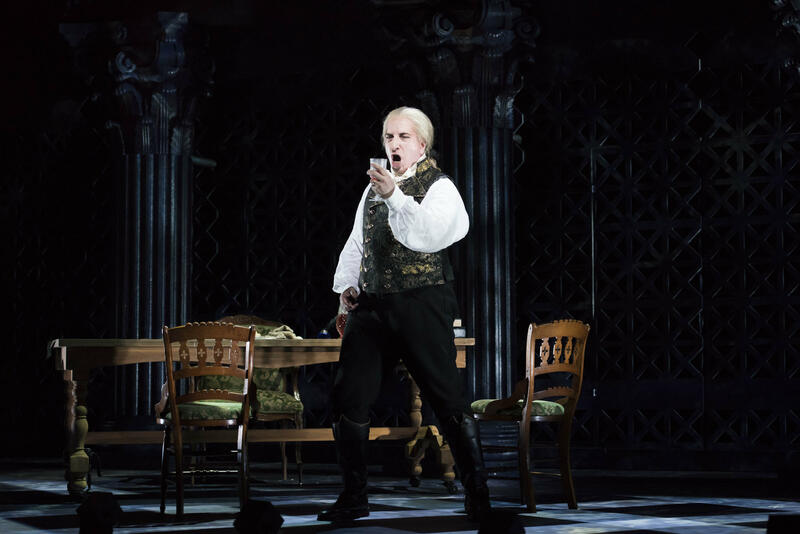 Tenor Jonathan Burton made an auspicious Boston Lyric Opera debut as an ardent Cavaradossi who is torn between protecting his friend and fellow revolutionary Angelotti and fending off the suspicions of his jealous lover, Tosca. "The real discovery of the day was Elena Stikhina, the rising Russian soprano, who made her American debut with this production." The real discovery of the day was Elena Stikhina, the rising Russian soprano, who made her American debut with this production. 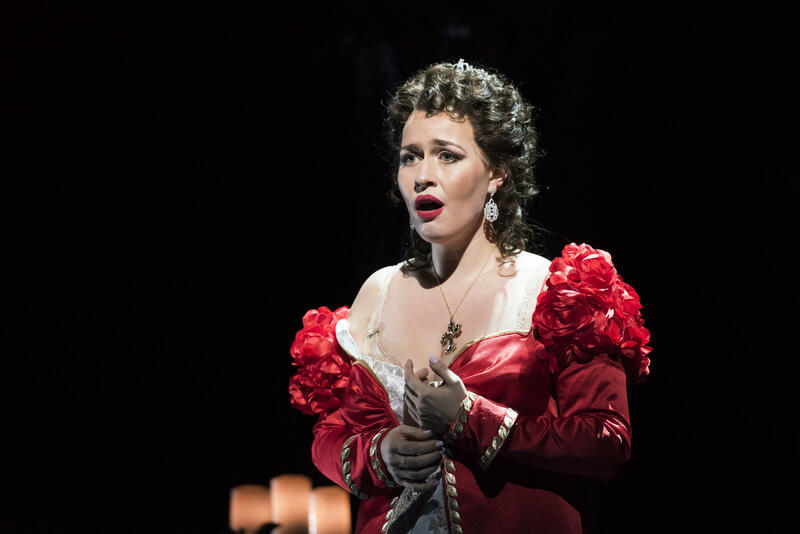 She is a member of the Mariinsky Theatre Ensemble (where Tosca is among the roles she has sung, also including Mimì in La Bohème, and Tatjana in Eugene Onegin). Her lovely voice was particularly effective in her big aria, "Vissi d'arte" in which she laments that having lived for art and love and been devoted to her faith, she doesn't know why God would punish her by having Baron Scarpia, the head of the police, force himself upon her. Daniel Sutin was a notably evil Scarpia in demanding that she give in to him in order to save the life of her lover. This introspective moment in a tense scene was one of the several ways in which the limitations of the Cutler Majestic added to the drama. Since the pit would accommodate only two-thirds of the full-sized orchestra Boston Lyric was committed to using, they played on a platform which represented the upper level of the church where the first act takes place. This unique setting allowed the conductor, David Stern, to be visible to large parts of the audience, while the orchestra itself was mostly unseen behind a scrim with a view of the city of Rome. That strong cast kept our attention riveted to the stage. A circular staircase led to the levels, and was used to good purpose as Baron Scarpia mounts it to sing of his desire to take Tosca by force while the chorus is singing a Te Deum in the powerful ending to Act I. And the orchestra pit was covered, giving more acting area for a greater feeling of intimacy for "Vissi d'arte" among other moments. I did wonder how this set would accommodate the final act of desperation by Tosca, but a satisfactory solution was found and the scene lost none of its impact. There are three more performances of Boston Lyric Opera's production of Tosca: this Wednesday, Friday, and Sunday. Coming up in November is the world premiere of The Nefarious, Immoral but Highly Profitable Enterprise of Mr. Burke & Mr. Hare, in March The Threepenny Opera and in May, in celebration of the centennial of Leonard Bernstein, the double bill of Trouble in Tahiti and Arias and Barcarolles.